With six sessions in each volume, this series provides small group members with basic yet comprehensive training on how to live healthy, balanced, purpose-driven lives. An experienced team of writers will take you on a spiritual journey, discovering not only what God created you for but how you can turn that dream into an everyday reality. Experience the transformation firsthand as you begin Connecting, Growing, Developing, Sharing, and Surrendering your life for him. "Doing Life Together is a groundbreaking study . It's the first small group curriculum built completely on the purpose-driven paradigm .The greatest reason I'm excited about it is that I've seen the dramatic changes it produces in the lives of those who study it." - From the foreword by Rick Warren. 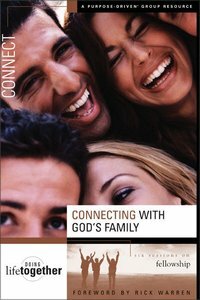 About "Connecting With God's Family (Doing Life Together Series)"
Dee Eastman is the co-director of the women's Bible study at Saddleback Church called 'The Journey.' SPANISH BIO: Dee Eastman es co-directora de una clase biblica para mujeres denominada. El Viaje, en la Iglesia de la Comunidad Saddleback Valley. With six sessions in each volume, The Doing Life Together series provides small group member with basic training on how to live healthy and balanced lives.